In the Autumn of 2012 when we made the decision to sell up, we knew that we were heading for a stressful time and that to start with it would be hard work getting everything ship-shape for Spring 2013. That was when we intended to put Ravendale House on the market. We assumed the hardest part would be selling for a good price in a reasonable time frame, after all the housing market was still recovering from the recession. As things turned out that wasn’t the case and we had 2 acceptable offers from the first 2 couples who came to view, but surely it couldn’t be so easy, could it? As expected the physical work of decorating, gardening, cleaning etc had been hard work, but throughout I was encouraged by the notion of being able to live in my dream cottage. Why? Well, we’d seen ‘Ivy Cottage’ for sale in an estate agents window in January 2013. 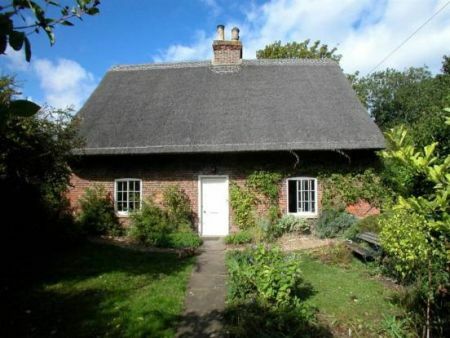 A 17th century, detached, thatched, Grade II* listed cottage with a garden to die for. For me it was love at first sight. We did a couple of ‘drive-by’ viewings and I knew instantly I was meant to live there. Being a normally sensible and level headed person, not prone to flights of fancy, this over whelming feeling was out of character, unexpected, not to mention scarey, and took us both by surprise. Peter struggled to understand why I felt so strongly about it and I struggled to explain. During the long hard months of January and February when the days were cold and dark (and I had to paint one particular wall in the small bedroom 5 times due to my own stupidity), I was comforted by thoughts of living in ‘Ivy Cottage’. Peter however, was more circumspect. Once the decorating was finished and our house placed on the market we felt able to view ‘Ivy Cottage’ internally for the first time. What a shock. To say it was old fashioned would not do it justice. I don’t mean 1930’s old fashioned, more 1730’s, it was amazing, though obviously not everyone’s cup of tea. I was looking at it through rose tinted glasses, and even I was shocked. The ceilings were low, the doors and windows were small and the staircase so steep it should have had built in ropes and pitons. Nevertheless, I still loved it. Peter remained circumspect. In my head it was always summer there. In my imagination I was sitting in the garden with a cup of tea, surrounded by hollyhocks, delphiniums, bumble bees and lots of cats. I knew I was being fanciful but simply couldn’t stop myself. Meanwhile in the real world Peter was struggling with mathematical calculus to work out if our furniture would actually go through the front door, never mind up the stairs.I felt guilty, but just couldn’t help myself. Despite the obvious problems he could see how much I loved it, even if he didn’t understand why, and agreed we would try to buy it when our house sold, providing the price was right. Obviously a big worry was would it sell before we were ready, but as it had already been for sale for 4 years there was a good chance it might hang around. Friends said to me things like “if it’s meant to be it will still be there when you’re ready”. Sound and sensible advice, and advice I increasingly began to believe when in May it looked like the cottage was under offer, but a couple of weeks later it came back on the market just as our house sold (STC), surely an omen if ever there was one. We made 2 further visits and must have spent about 5 hours in total looking round and talking to the owners, who were only too happy to talk about their unique home. It turned out they were in the latter stages of moving to Austria where they had already bought a house. Excellent news as the cottage was already virtually empty and there would be no ‘chain’ involved at either end of our transaction, one less thing to worry about. We made an offer, much lower than the asking price, but one that we felt reflected the obvious problems and drawbacks associated with such an unusual property. Weeks dragged on, negotiations continued. On Friday July 26th we made our third and final offer, sadly it was refused. The owners were sticking out for a further £15K which we were simply not prepared to pay given it’s potential for being a ‘money pit’. And so the dream of living in a picture perfect, thatched country cottage was over. (Or was it???) Peter breathed a sigh of relief.